The Perrier brand, which marks its 150th anniversary this year, is rolling out Perrier Slim Cans in Canada to celebrate the spring and summer seasons. The slim aluminum 250 ml single-serve cans contain the French carbonated water with natural, pink grapefruit and lime flavors with no sugar and zero calories. The cans are available nationwide at the suggested price of $6.99 for a 10-pack. The new sleek on-the-go format joins other 100% recyclable packaging of 250 ml and 330 ml cans, 500 ml PET plastic and 750 ml glass available on the Canadian market. The cans with a slimmer shape and bubble-inspired design have come to Canada after the launch in the USA and Middle East in 2012. 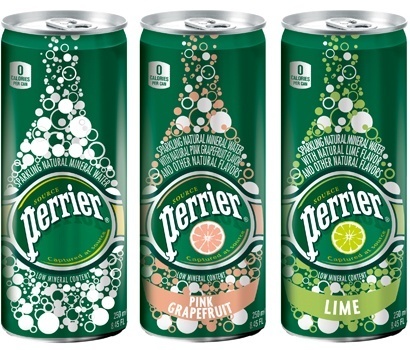 “Perrier Slim Cans offer a tasty, thirst-quenching healthy choice that will keep consumers properly hydrated in the most convenient, satisfying and pleasurable way possible,” shared Jennifer Semley-Robert, Marketing Manager, Premium Brands, Nestlè Waters Canada. To celebrate its 150th anniversary, Perrier is launching a massive campaign, teased on the brand’s official Facebook page, which states that the “game” will start on April 2. It is also announced that the brand’s fans will be encouraged to join “a fascinating digital experience” and even play an online game for a chance to win a prize. According to the press note, as part of the massive celebration, the brand will focus on “that unique artistic encounter between Andy Warhol and Perrier,” unveiling a “Warholised” artistic series of cans and bottles.